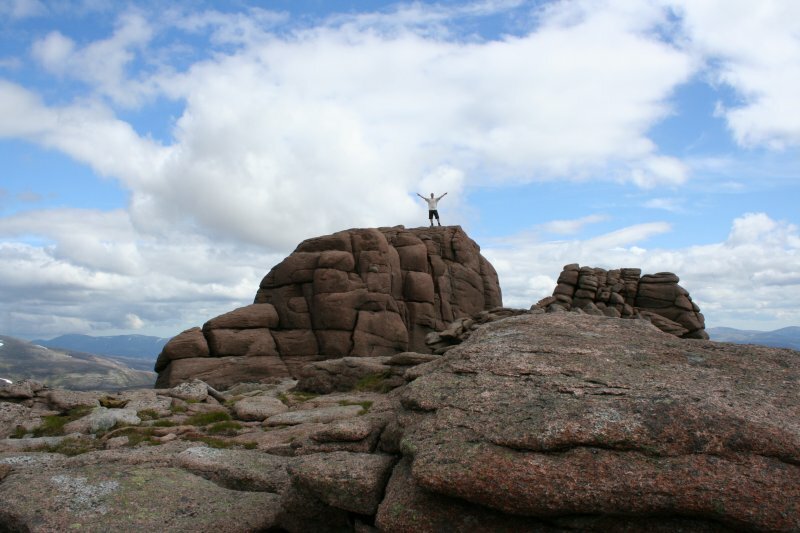 After the Dundee half marathon, Ian took a week off work and we went for a mini camping trip to Aviemore, a small town situated in the middle of the Cairngorm Mountains. 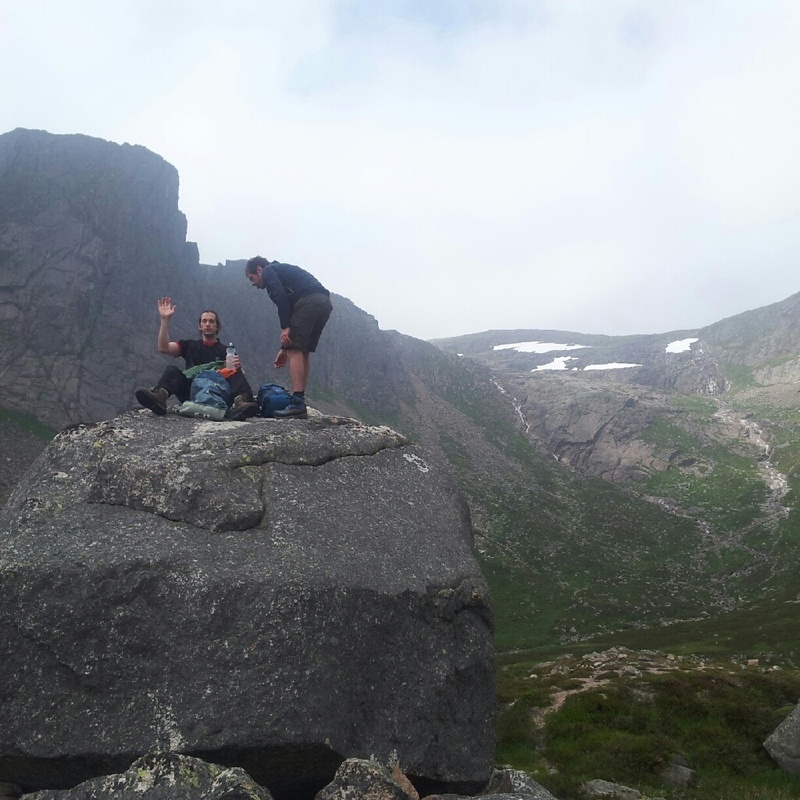 We set off on Monday morning, and camped at Glenmore, which is a campsite a short walk from a lake, Loch Morlich. We had been here once before, but the weather had not been our friend on that occasion, and all outdoor activities we did were in the rain. And maybe sleet. 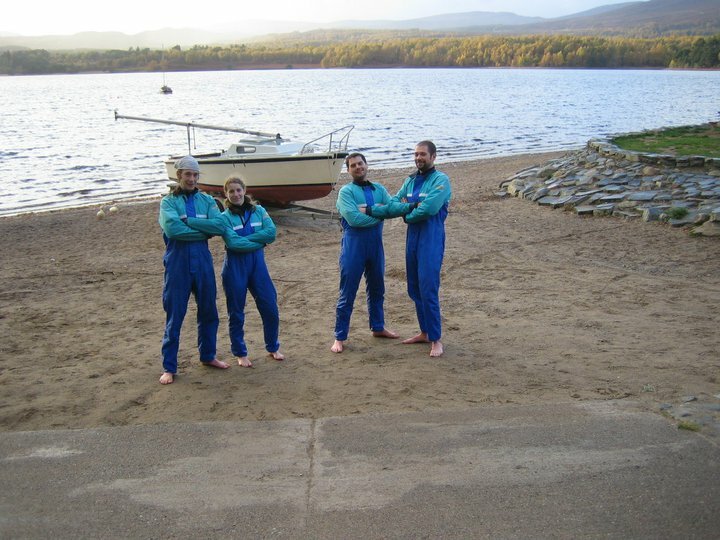 This time, however, we were greeted by people sunbathing outside of their tents, so once ours was set up, we put on our swimming costumes and headed for the Loch Morlich water sports center. Ian had wanted to go sailing on a fun boat (which we had done before, with limited success), and we were soon in our wetsuits hauling the fun boat into the water excitedly. Unfortunately, the crappy weather we were glad to have avoided is much more conducive to sailing, and the calm, warm breeze was not launching us through the lake at any decent speed. In fact, at one point we were mildly worried that unless a breeze came along, we’d be forced to swim back to shore! Eventually, we made it back, stripped off the wetsuits, and even managed to enjoy a bit of time sunbathing (I use this term very loosely) on the shore before heading back to the tent. Once dressed, we drove to the nearest supermarket and picked up dinner, as well as supplies for tomorrow, and had a fairly early night after I destroyed Ian at backgammon. On the Tuesday, we were both up early, and started cooking a hearty breakfast for three. Our friend Craig was supposed to be meeting us for food before we all set off hiking. Unfortunately, he got lost, and Ian and I were forced to eat all the extra food while we waited. Once Craig turned up, we set off the Cairgorm railway parking lot, which is about halfway up the mountain. 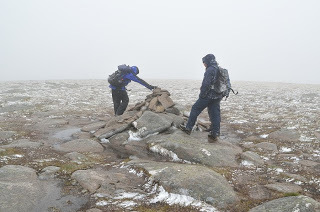 I know technically it’s cheating, but we had all climbed Cairngorm several times before, and today it was merely an obstacle in the way of our main destination, Beinn Mheadhoin (to hear how the hell you pronounce this, go here). Ian and Craig on a big rock. The ascent to the summit of Beinn Mheadhoin was steep, with lots of loose rock which made it pretty hard to get a firm foothold at times. About halfway up we heard (and occasionally saw) a mountain rescue helicopter fly past, and we hoped it was training rather than necessity, as the cloud was providing very limited visibility – at times we could only really see about 20/30 feet ahead. About 2/3 the way up it started to rain. Delightful. You may be wondering why I’m shamelessly using other people’s photos for this post instead of my own. I’ll get to that. 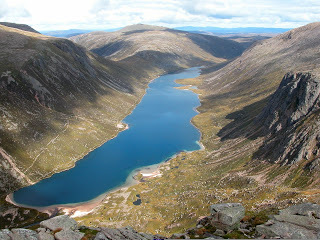 We had lunch at the top, but it was starting to get a bit cold, so we were soon on our way back down towards Loch Avon for the long walk back to the car. 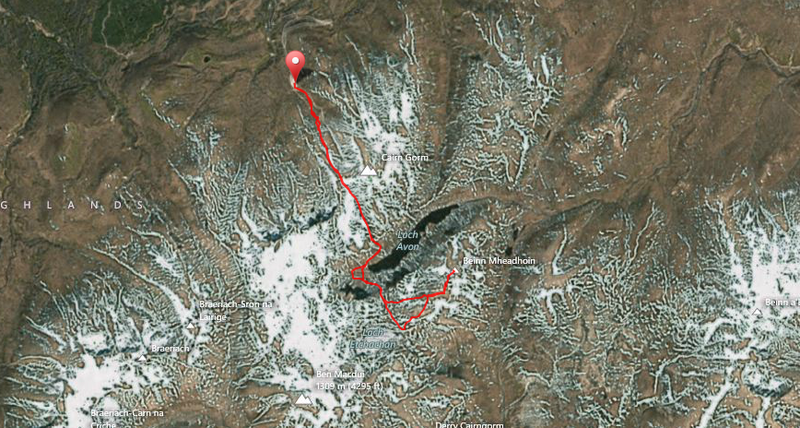 Overall, we covered 12.5 miles, and had a total elevation gain of 1,388 meters. By the time we finished, we all had sore, blistered feet (1000 miles socks, you are the WORST), and were in the mood for food. After a quick shower at camp, we went out for Italian, and for the first time in my life I didn’t complain when they got my order wrong because I was too hungry to wait for them to re-make what I actually wanted. Craig left after dinner, and Ian and I went to lie down in the tent “just for a couple of minutes”. It has been a while since I’ve slept fully dressed. The next day, the weather seemed alright, but thunderstorms and rain were predicted for the rest of the week. We followed the other campers who were packing up early, and decided we had had plenty of rainy camping experiences to date, thank you very much. Before we were willing to leave, however, we decided to go canoeing in Loch Insh. At the watersports center, we realized we didn’t have time for the canoe day trip, instead opting for a 2 hour hire in the lake. We began a relaxing journey around the edge of the loch, realizing we probably could have opted for the single hour to get around, at a push, but decided that this way gave us the opportunity to relax and check out the wildlife. We passed a pair of swans and I asked Ian to take a picture. We also came across a ram, some ducks, and were just about at a small island where Osprey were nesting when I heard panicked noises from behind me. Ian was frantically searching himself, but we eventually realized that somehow his camera, which he had tucked into his life jacket, was no longer on his person. Or on the canoe. We backtracked for a while to see if we could spot it bobbing in the water, but we weren’t optimistic that it would float in the first place. Defeated, we rowed to shore. Ian was not happy, and all of our photos from the day before were lost forever. Loch Insh. But this photo is from October 2010. The car drive home was not a joyful one, and while it’s annoying that we don’t have the photos (and Ian is down a camera), at least it was an otherwise enjoyable camping trip in remarkably nice weather, for a change! Oh, and I totally count the 12.5 miles of hiking towards my monthly mileage. We’ll call it ‘hill reps’. 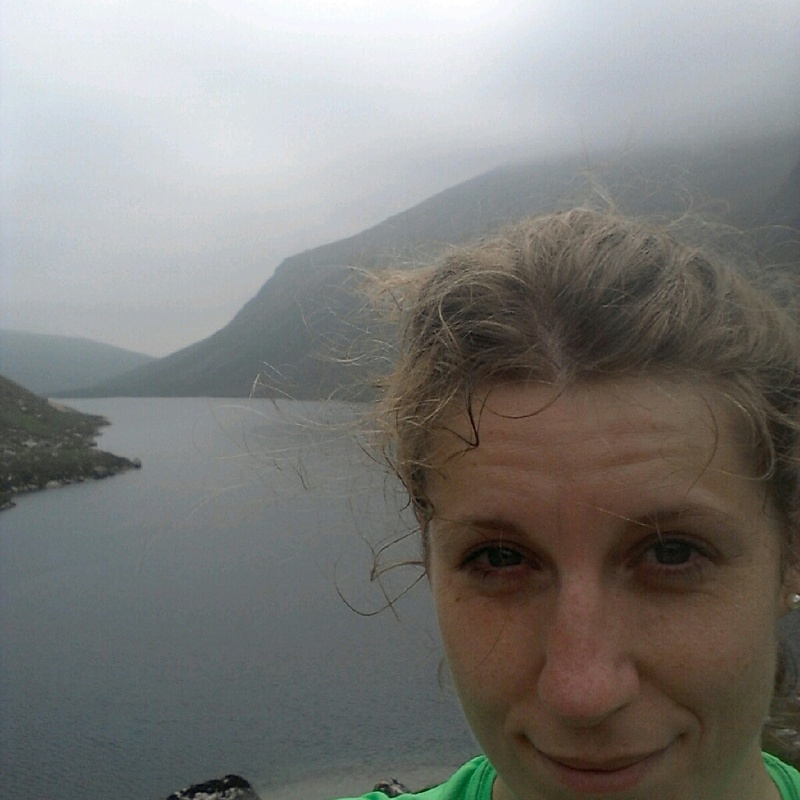 This entry was posted in Uncategorized and tagged Aviemore, beinn mheadhoin, cairngorm, camping, Loch Insh, Loch Morlich, munro, Scotland, water sports by MedalSlut. Bookmark the permalink.